Momentum-driven Vortex Phase Separators (MVS) provide gravity-independent separation and inventory management of liquids, gases, and solids within a fluid system using a simple, cost efficient design. The separation process, which relies on buoyancy, is driven by centripetal acceleration of the flow. This approach provides environment independent, orientation insensitive, and acceleration resistant operation. In addition, an MVS can be designed to separate much more rapidly than a similar gravity-driven device, which allows for significant volume and mass reduction while maintaining equivalent throughput. The primary components of an MVS are a cylindrical separation chamber, a baffle plate, tangential inlet ports, and axial outlet ports. Flow enters through the tangential ports, which are designed to maximize flow momentum and minimize pressure drop. 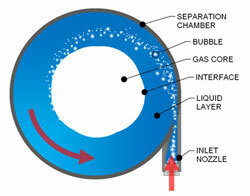 The flow is centripetally accelerated by the wall of the separation chamber and a vortical flow field is produced. Fluids of different density are then separated as dictated by the balance between buoyancy, inertial, and drag forces. As long as sufficient density differences exist, the components will form stratified, axisymmetric layers. Each component is extracted through individual outlets located within these layers. The baffle plate provides axial separation of the flow components for increased separation reliability and the ability to accumulate flow components. The MVS design produced by ACT has two unique features that allow for the operational simplicity of the device. First, the introduction of a baffle plate into the separation chamber provides axial separation in addition to the radial separation produced by the vortex. This separation does not rely on gravitional forces but occurs as a result of the axial flow patterns induced by the location of the component outlets. The baffle plate is sized to allow the location of the interface between components to fluctuate without disrupting separation efficiency. As a result, a MVS can be designed to accumulate flow components and passively respond to system transients with no interruption in operation. Second, a MVS does not require any moving parts. This feature provides a distinct advantage over more common vortex separation techniques, which often involve a high-speed rotating disc or separation chamber. By using a fixed chamber, complicated seals are eliminated and power requirements, failure modes, and overall device complexity are greatly reduced. This, in turn, significantly reduces fabrication costs and maintenance requirements while increasing reliability and operational lifetime. In addition to these features, heat and mass transfer can occur between components while they are in contact with each other. This contact time is a function of MVS design and can be tailored to allow the MVS to function as a Direct Contact Heat Exchanger (DCHX). In a DCHX, heat transfer occurs with minimal thermal resistance between flow components, which allows for maximum thermal energy transfer. 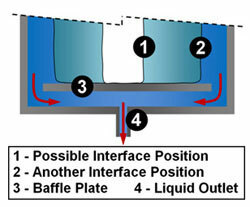 This low resistance is possible because heat transfer occurs at the interface between flow components, a droplet’s surface for example, rather than through an intermediate material, such as a copper fin. Also, since the heat transfer surface is continuously recycled in a DCHX, fouling of this surface, a common problem with heat exchangers, is not possible. Finally, compared with a gravity-driven DCHX, the MVS maintains superior separation characteristics that allow for significantly reduced size at equivalent throughput. Recently, ACT licensed this technology from TAMU and successfully developed two terrestrial MVS-based systems for the military within the same year. This video below is a brief summary of a microgravity two-phase thermal management prototype developed for the NASA Jet Propulsion Laboratory under the SBIR program. 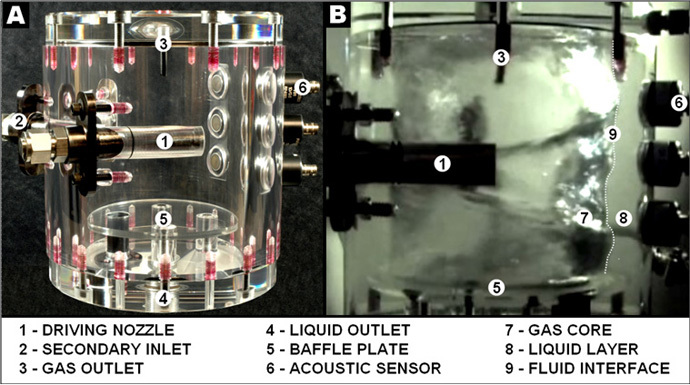 The main components of this prototype system are a vortex phase separator, single-phase pump, two liquid-driven eductors, three 100 square inch cold plates, and a condenser. This system was successfully tested in the laboratory for heat loads up to 3 kW and is awaiting additional funding for reduced gravity testing. Key features that were demonstrated included nearly isothermal cold plate surface temperatures, stable flow management during heat load transients, and reliable fluid transport using the single-phase pump, eductor, and phase separator assembly.